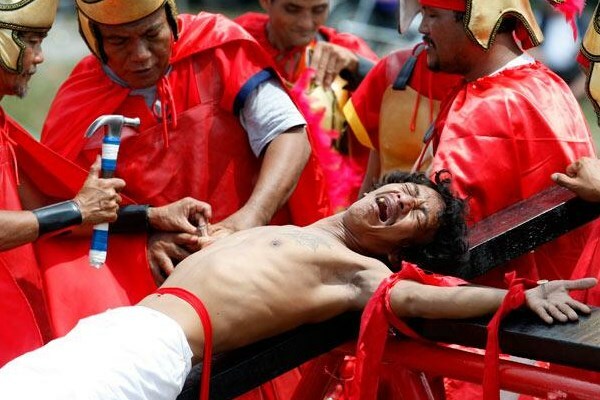 Officials of the 2015 Holy Week committee say they will ban foreigners from being crucified on Good Friday in Cutud. “This is also to ensure law and order and safety of the residents and the thousands of visitors,” he added. It was reported that a Dutchman had asked be crucified in 2014 but backed out. This caused a stir and disappointment to San Pedro Cutud officials. Cllr. Quiwa said that more than 60,000 foreign and local tourists were expected to witness the crucifixion of at least seven people on Friday afternoon. Among them, 76-year-old Bob Velez of Barangay Santo Niño, will be crucified for the 36th straight year on April 3. He and Ruben Enaje, 54, of Barangay San Pedro Cutud, attended the press conference. Mr Enaje will be nailed for the 29th time on Good Friday. He said there will be at least seven local residents who will be nailed up, including him and Mr Velez. He added that one penitent each from Laguna, Cavite and Polilio Island in Quezon province may also join them. “They will join if they arrive on Friday,” said Mr Enaje. Mayor Edwin Santiago said the city government was allotting about 300,000 pesos to ensure the safety and success of the annual rites. “There will be no income for the city but there will be enormous benefits for the small and big businesses not just in San Fernando but in other cities and towns in Pampanga,” said Mayor Santiago, who joined Cllr. Quiwa and Vice-Mayor Jimmy Lazatin at the press conference. Santiago said that hotels in nearby Angeles City will also benefit from the Holy Week rites at Pampanga’s capital city. He added that most foreigners who watch the spectacle stay in Angeles City. It was in 1962 when public crucifixions were conducted in San Pedro Cutud, which is about 50 miles North of Manila. Then aspiring faith healer Artemio Anoza was the first to be nailed on the cross and the first to act as Jesus Christ.